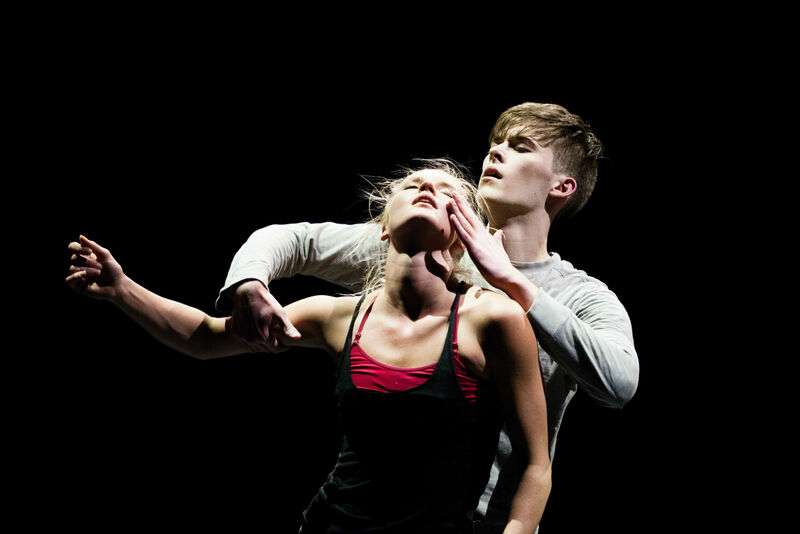 For three nights, Seattle Center’s Cornish Playhouse (formerly Intiman Theatre) filled with “whimmers”– artistic director Olivier Wevers’ term for fans of his contemporary dance company Whim W’him–come to watch Instantly Bound, the initial offering of the company’s fifth season. The performance provided the first opportunity for Seattle audiences to view the newest members of the company’s expanded roster which also included the new hire of an executive director for the young non-profit. 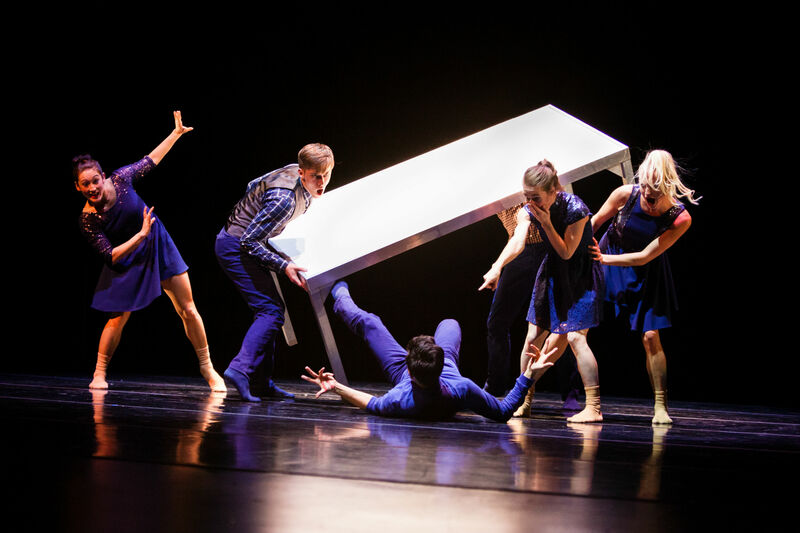 Spanning three diverse works—two by Wevers and one by guest choreographer Juanjo Arques—Instantly Bound was an emotional romp worthy of primetime programming. Wevers’ titular work opened the evening, an intensely dramatic piece reacting to mass shootings. Smartly avoiding the potential trap of a morality tale, Instantly Bound instead unfolded through scenes connected by a bright circle of white light stroboscopically illuminating a montage of choreographic images that invited the audience to react emotionally rather than intellectually. Both music (by Klimek, Ezekial Honig, and Jóhann Jóhannsson) and lighting (skillfully executed by designer Michael Mazzola) set a tone eerily reminiscent of first-person shooter gaming, a wry nod to the debate on gun violence. The costumes colored dancers in newspaper shades of black, gray, and red in reference to journalistic coverage of such tragedies. With rapid-fire speed, dancers hurtled across the stage, stretching, reaching, and connecting frantically in bursts of partnering, only to flee the unseen violence. Using exaggerated extension through all joints, dancers searched for both escape and meaning. Wevers’ choreography made skillful use of muscle tension to depict the central nervous system’s reaction to heightened stress. At the climax of the work, dancers Tory Peil and Kyle Johnson lay facedown within the bright pool of light, circled by onlookers. Ominously, the light spread outward as if flowing blood. Peil and Johnson danced the final duet as undertones of somber organ music wove through the score. Although overlong, this duet of lives cut short, of youth commenting at its own funeral, provided an introspective end to Instantly Bound, as if asking the audience to question its participation as spectator. 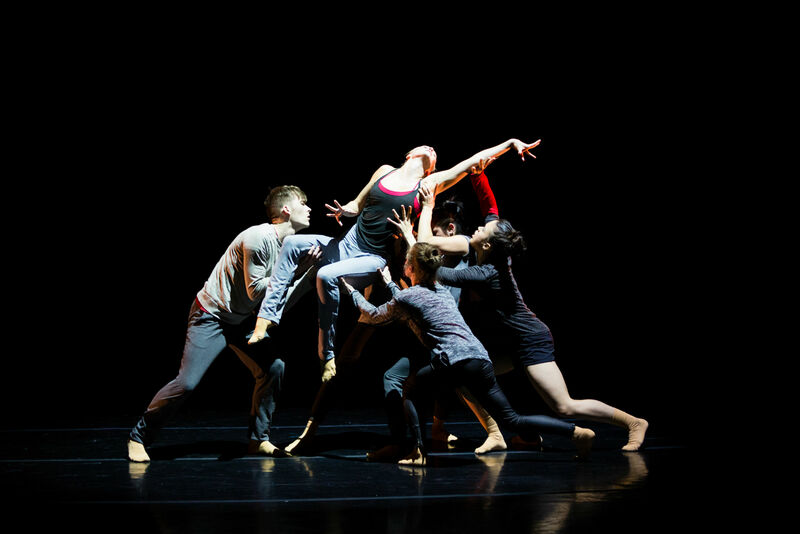 Arques’ Crossroads depicted a series of relational interludes danced by the entire company. The curtain opened to reveal a sparse, geometric set with flat, angular panels of undressed wood walls suspended in the air. In crafting Crossroads, Arques sculpted the guided improvisational work of the dancers, a technique often employed in contemporary dance. This dancer input created a sense of non-verbal dialogue overlaying the numerous coupled sections throughout, a feeling of reaction versus staged, studied movement. Aaron Martin’s score also generated this impression of dialogue, polyphonic layers of electronica as conversation. A sense of angst and desperation blanketed Crossroads, a work more about liaison than true connection. The loose narrative evolved melodramatically, dancers attaching in superficial bonds that easily unraveled and just as simply reconnected. In this way, Arques almost created an onstage soap opera, however, the lack of a convincing context for the characters in Crossroads precluded empathy for its exaggerated idea of narrative. Also, Arques shod his female dancers in de-shanked pointe shoes (shoes rendered incapable of supporting the body weight en pointe), an odd choice whose purpose toward the work as a whole remained unclear. Overall, the expert dancing of the cast advanced Crossroads to a greater extent than the choreography. The program ended on a lighter note, with Wevers’ Les Sylphides serving as the evening’s sitcom offering. Set to the Chopin score from the early 20th century ballet of the same name, Les Sylphides revolved around an intimate dinner party for seven, each guest a stock character from comedy: the flirtatious host and her weak spouse, the drunk couple, the host’s love interest and his mostly unsuspecting wife, and the unwelcome “friend.” Clever use of a long table as the sole set piece (as table, walls, and door) completed the scene. Wevers’ ability to create choreographed humor was especially pronounced in Les Sylphides—slapstick physical comedy seamlessly blended with the dancing. With inebriated conviviality, the dancers sketched fully fleshed, relatable characters within a humorous situation; they were over-the-top without becoming self-conscious in their roles. With allusions to The Green Table as well as the Three Stooges, Wevers delved into choreographic realms on par with classic screwball comedies, Looney Tunes cartoons, and Seinfeld. The stars of the entire night though were the eight dancers of Whim W’him, moving with organic fluidity and surgical precision throughout the works. Without these incredibly talented dancers, Instantly Bound would have resonated with decreased impact. These artists articulated the beauty of contemporary form, where line appeals through initiation and intent instead of shape, and where the awkward, raw, and realistic often replace immaculate perfection. The group’s ability to appear human to the audience while performing inhuman feats of technical skill and strength proclaimed Whim W’him as both a company commanding respect and worthy of continued scrutiny. Learn more about the company and find out about upcoming performances at whimwhim.org.